This article will explain why Olson Iron Works has chosen to use High Grade Industrial Primer and Extra High Grade Enamel Paint opposed to the powder coating method. With the combination of a high grade industrial primer and paint, your product will not only look better and last longer than powder coat, the time and cost involved in regular maintenance is cost effective and manageable by the home owner. When the time comes time to re-paint your home every 6-10 years, you just simply paint the iron as well. You cannot just repaint powder coating with powder coat, you must uninstall the iron, sand blast it, re-powder coat and then reinstall it. WOW! What a waste of time and money all due to lack of information and knowledge of powder coating wrought iron. 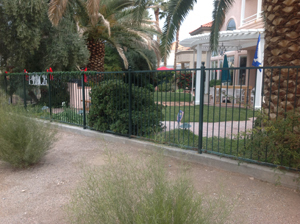 The Del Webb Master Planned Community in Henderson and the Sun City Summerlin Master Planned Community in Las Vegas, along with dozens of other Home Owner Associations in the valley have imposed strict rules regarding powder coating in their community due to the major expense they have incurred since the early 90’s associated with the upkeep. But yet, in spite of the facts, contractors and retailers continue to push the hype and make money off your naivety. The powder coating method consists of layers where each stage of the process can negatively affect the next layer. There could be problems with the metal surface and this substrate may affect the pre-treatment and finally the powder coating itself. The surface of any substrate is bound to vary in smoothness. Blasted metal or any sharp edges must either be completely smoothed out or a thick layer of coating must be applied in order for it to resist corrosion. Sometimes, even microscopic protrusions may not be fully covered even if thick layers of coating are applied. 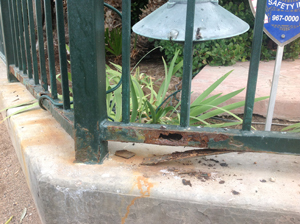 Generally, corrosion starts on the edge of a panel rather than in the middle of it. Metal edges can be particularly sharp and need to be ground down properly so that there are no small tips poking through the powder coating. 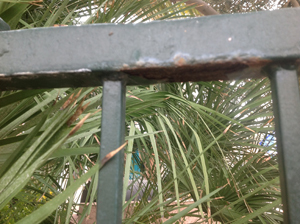 Corners may be hard to reach and if they are not coated thoroughly they are susceptible to corrosion. When metal objects are hung for their pre-treatment rinse, some sediment may accumulate at the bottom of the items and the powder coating often fails in places where this sediment has dried onto the surface. There may also be a lack of pre-treatment or the pre-treatment chemicals are not used correctly. Some parts of a metal surface may be more difficult to penetrate with pre-treatment than others, so extra care may not have been taken with edges, corners and recesses. Choosing an inappropriate powder coating is a common mistake because the environment the architectural metal work is in isn’t always taken into account. The surrounding conditions are more important for exterior metal than for products that remain indoors. Failures in powder coating can also stem from how it is applied. If the powders are applied too thinly, the patchy surface will not have full protection and could lead to corrosion. If a layer is too thick, flexibility will be limited. Sometimes, multiple layers are applied and each one has to be perfect for the optimal performance of the coating as a whole. Even if the substrate is correctly pre-treated, the powder coating may breakdown if it is not cured adequately. Powder coating takes a certain amount of time at a particular temperature to cure properly and powder that is under-cured will not be the most durable even though it may appear intact. Color degradation and a lack-luster finish may be an indication of improper curing. The baking cycle is an extremely important part of the powder coating process. The metalwork has to reach the recommended temperature for a suggested amount of time. That means all of the coating uniformly, not just the surface. Sometimes coating deteriorates if inferior ingredients are used with excessive amounts of filler material. Powder coating breaks down more quickly if it is outside in harsh environments. Extreme temperatures, weathering, UV light and collisions all impact on the coating’s integrity. Water, dirt and / or salt particles can find their way into the smallest crevice and insidiously corrode the paint by migrating under the coating. This results in an imperfect powdered finish. Irrefutably, Primer and Paint is the best way to coat your wrought iron project, hands down! 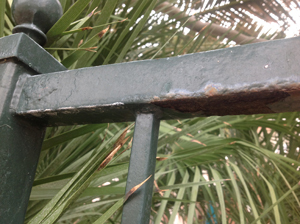 Below are several examples of powder coated wrought iron in it rusted, flaking and unrepairable condition. I have lived at my current address for 23 ½ years. 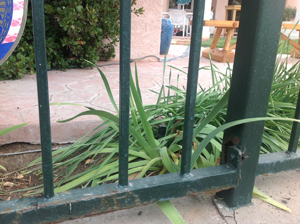 My original wrought iron fence was installed on the ground without benefit of any curbing under it and was surrounded by grass in my yard as well as on the golf course outside of my fence. It was liberally watered. Yet, except for a few new paint jobs there was no maintenance required and it stood for 18 years. This fence had primer and industrial enamel as its finish. Then, in 2008 I had a new fence installed AND I had an 8" curb placed under it to get it up off the ground. The ground was much drier then as well, as the golf course had replaced the grass behind my home with xeriscaping and I had done the same on my side. I was told that a powder coated fence would be the best finish and would last so much longer!! Imagine my surprise, when by 2012 the new fence was rusting so badly that large holes were appearing in the fence posts and the powder coat finish was coming off in slabs. And I now have to replace my $7,000 fence because it is so badly deteriorated. 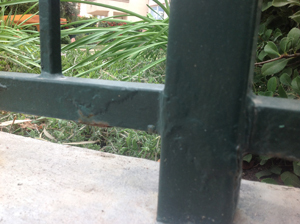 The powder coating has completely failed and whatever little water, whether irrigation or rain, that falls on the fence collects inside the powder coating and rusts the fence so badly it is entirely eaten through in many areas. All I can tell you is whatever you do DO NOT buy a powder coated wrought iron fence. To fix my fence now would require dismantling it, taking it off site to be sand blasted and them primed and painted and re-installed. As you can imagine, this will be more costly than replacing it altogether.